When you are walking on uneven surfaces, it is possible to twist your leg and get an ankle sprain. It can also happen while stepping off a curb or by making a misstep during an athletic event. Even activities that leave your foot firmly planted on the floor with your body getting twisted may put serious pressure on the ankle and cause an ankle sprain. That inward roll is the most common cause of sprained ankles, but an outward roll (eversion) may also happen. Soare there ways to make an eversion ankle sprain more manageable? Keep reading to learn about it. How Does an Eversion Ankle Sprain Happen? An eversion sprain occurs on the inside of your ankle. There are deltoid ligamentsin this area with a role to prevent inward twisting of your ankle. Eversion sprainscause a tear of your deltoid ligaments. This kind of sprain is also referred to as a deltoid ligament sprain or a medial ankle sprain. Eversion sprains are quite rare for two main reasons. First, the fibula bone usually keeps the ankle from moving to the extent to cause a sprain. It means the bone keeps your food from moving in a direction that over stretches your ligaments. Second, the medial ligaments are relatively stronger on the inside of your ankle, which is the reason why you are less likely to deal with an eversion sprain. Thus, an eversion sprain is often accompanied by a fracture of the lateral malleolus, which is located at the end of the fibula. You can feel it as the bony outside of your ankle. When an eversion sprain happens, other ankle bones such as the talus could also be broken. First degree sprains: you only damage a few ligament fibers with these sprains. The most common symptom is pain that hits you when trying to turn your foot in or out. You may also experience pain upon touching the affected area. Second degree sprains: you may have a more extensive damage to the ligaments in this type of sprains. You will experience serious pain with severe swelling around the affected area, which aggravates with walking. Third degree sprains: you will have a complete rupture of the ligaments in these sprains. Sometimes, you may also have a joint dislocation which makes waking impossible after this type of sprains. You will also notice deformity as well as severe swelling. 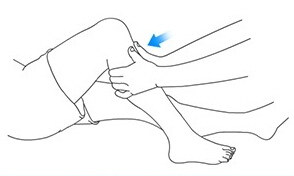 The anterior drawer test: The doctor will hold the heel of your affected leg and pull it forward while holding your lower shin with the other hand. The taler tilt test: they will rotate your ankle outward while making you put some weight on the injured ankle. You may have a fracture if you experience pain the moment your doctor touches a bony area. If your doctor thinks that you may have a fracture, he/she may also order an x-ray of your ankle to find out. 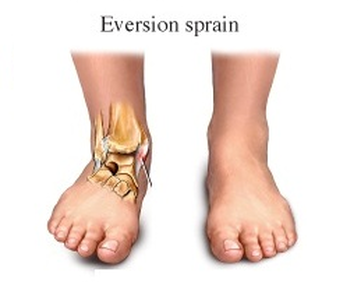 What Can I Do About an Eversion Ankle Sprain? If you indeed have an eversion sprain, you will need medical attention. However, there are certain steps you can take immediately after sustaining the injury. Stick to the PRICE protocol – that is, protection, rest, ice, compression, and elevation – at least for the first 48-72 hours. It means you have to avoid activities that would cause further damage to your ankle and use crutches to give your ankle enough rest. Apply ice for about 20 minutes once per hour and wear compression wraps to decrease swelling. And of course, keep your foot elevated above the heart level to reduce swelling. Your doctor may prescribe you with anti-inflammatory medication to reduce pain and swelling. Meanwhile, consult a physical therapist for important advice on your posture, footwear, bracing options, orthotics, and return-to-play protocol. He/she may also make use of laser and ultrasound treatment to alleviate swelling and pain.Friction massage is another popular choice used to reduce scar tissue development and promote healing. Working with a physical therapist will prove beneficial and help you understand how to improve muscle strength and flexibility after your injury. You will require rehab to strengthen your joint after an eversion ankle sprain. This helps prevent any future damage to your ankle. Your rehabilitation program may start 2 weeks after your initial treatment for the swelling to subside. Your therapist will explain how to perform different exercises. It usually starts with towel exercises, which involve placing a towel around your foot and pushing through your toes while grabbing the towel from both ends.If you feel any pain, stop the exercise and try flexing your foot instead. A resistance band is another nice option to use in this case. You can rotate your foot from side to side with the resistance band. Be sure to move your foot up and down as well. Keep in mind that it may take up to 6 weeks to heal completely– it may take longer depending on severity of the eversion ankle sprain.So, be sure to work with your therapist to accelerate healing and return to your normal activity as soon as possible.